Since you're having trouble with my argument, let's focus on yours. After all, it is your thread. You say that a late-term fetus has rights because "it could live outside the mother if given the opportunity." Yet once the baby is outside the mother, it "would not be able to survive very long without someone taking care of it." If we perform a little math, the bits about "could or couldn't survive" cancel each other out, and we're left with the final part about "someone taking care of it." Perhaps this is an expression of your actual standard for rights: dependence. Does a human baby have rights because of its "undeveloped nature" which makes it dependent on "someone taking care of it"? I might have to refamiliarize myself with these fallacies, but I’m not sure how this is ad hominem? He replied and then in my next response I was just clarifying his position, and then I qualified why I think leaving it to die is the necessary conclusion of abandoning a child at birth. I’m interested on why you think that is ad hominem? You're right. I understand the context now. It's not. More like a red herring, to change the subject from the baby to the mother. That's fine, though. I can discuss the mother, if you want. No, a mother does not have a right to abandon her child and leave it to die. People are responsible for their actions. A woman could adopt a baby or give birth to one, either way it's hers, and she is therefore responsible for it, like she's responsible for anything else that she produces or acquires. Because we're talking about an actual human being, the mother must respect its rights and properly care for it, otherwise the state should intervene. I don't think it's fair to classify my comments as "like a red herring." It's either fallacious or not, but a quick review of the sequence of the conversation would prove it isn't. Can't say the same for you though, as you have been using ad hominem attacks throughout this topic, which is partially why I haven't been so eager to respond. You don't have a standard for rights. Hopefully it can be respectful and honest moving forward. A developed fetus has rights because of it's nature as a human being and its potential to develop into an independent, rational adult (similar to newborns). There is a point when the "thing" inside is clearly no longer just human cells, but has developed fully enough to surpass the realm of potential and now actually has the characteristics where it deserves classification as a human being. As such, it should be considered as what it is: a human being physically dependent on the mother for life. How to determine whether or not an entity is a human being is up for discussion but there have been a few suggestions in this thread that I think are worthy of debate. "A fetus is physically dependent upon the mother's exercise of her rights. Therefore it has no right to its own life until it acts toward the removal of that dependency." I don't think there is a fundamental distinction (only a distinction in form) between the physical dependence via the womb and physical dependence via mother's care for a newborn. Therefore, I think your red line of obtaining rights when it gains "independence" is arbitrary. A baby's nature a week before birth and after birth didn't change significantly (I.e. in kind) and neither did it's dependence. Yes, it's separated by the mother's physical body, but it still depends on the mother's physical body to care for it's basic survival needs. It's the entity's nature that determines it's worthiness of rights, not the arbitrary distinction between womb and non-womb. This is a form of the classic "potential" argument. It's not worth debating for the millionth time. There﻿ is a point when the "thing" inside is clearly no longer just human cells, but﻿ has developed fully﻿ enough to surpass the realm of potential and now actually has the characteristics where it deserves classification as a human being. Which characteristics? Are we back on consciousness and feelings? Earlier, when I countered that initial notion, you switched immediately to the old "viability/potential" argument: it could live outside the womb which indicates a potential to become independent. At this point I realized that we probably fundamentally disagreed on the definition of a human. We weren't even talking about characteristics particular to the higher animals (consciousness and feelings). Viability and potentiality pertain to the entire living world. So I asked for your definition of a human being, but so far I don't see an answer. Is my suggestion not worthy of debate? A﻿ rational animal is a multicellular organism of the kingdom ﻿Animalia, possessing a rational faculty. An organism is an individual living body composed of organs. I don't think that's the main issue. I hope you'll focus on what you said here: "It's﻿ the entity's nature that determines its worthiness of rights, not the arbitrary distinction between womb and non-womb." You focus too much on the entity's relationship to the mother, and not enough on the entity itself. Why are the changes to its nature before and after birth arbitrary? "I don't think there is a fundamental distinction (only a distinction in form) between the physical dependence via the womb and physical dependence via mother's care for a newborn. Therefore, I think your red line of obtaining rights when it gains "independence" is arbitrary. A baby's nature a week before birth and after birth didn't change significantly (I.e. in kind) and neither did it's dependence. Yes, it's separated by the mother's physical body, but it still depends on the mother's physical body to care for it's basic survival needs. ﻿It's the entity's nature that determines it's worthiness of rights, not the arbitrary distinction between womb and non-womb." Basically I was saying that independence didn't change from womb to non-womb. But now I think I may have been using independence in two different senses: a metaphysical sense (i.e. literally still being connected to the mother) and ethical sense (i.e. it is still dependent on the mother physically but only in an ethical context). I was saying because the dependence was still there, the distinction between womb and non-womb is arbitrary (before I realized the mix up). But the real question is whether metaphysical independence (i.e. being a separate entity) is an essential characteristic of the nature of man and the context of rights (as I think you were alluding to/arguing). And then I see how that connects to the potential vs. actual. Yes, that's a good question. Let me share a bit about my history with this subject. Maybe it'll be helpful. I was raised a Christian. Until college I believed that man was created by God, and that the defining part of man was his soul. Even after becoming an atheist and studying Objectivism, my religion-based concept of man lingered for many years. Then I solved my metaphysical problem relating to the soul-body dichotomy. Man is not a soul in a body. He is a body with a soul. They are inseparable for humanness, but the body is primary. You can have a soulless body, but not a bodyless soul. I then had to define what was a body, before I could even worry about what was a soul, and later what was a human body with a soul with rights. Now, you have asked whether being a separate entity is an essential characteristic of the nature of man. I ask you, what would man be if it were not an essential characteristic? Would he be a connected entity? Or would his physical separation or connection not matter? For argument's sake, let's say it doesn't matter, and a late-term human fetus is a human life. Now, let's pretend that there is a fetus that never outgrows the womb, it achieves a state of perfect harmony with the mother, and it could survive in there for the mother's entire life. In fact, it has been determined that removing the fetus will kill it. Does that connected entity have a right to life? No, it isn't a particularly good question. A human being is what it is: we don't define it in or out of being. The entity that is a human being one minute post-delivery is also a human being one minute beforehand; to say that it is not yet "a human life" because it fails to satisfy some ad hoc, contrived definition (in this case, because it is "connected") is a classic example of rationalism. There's no need to resort to such outlandish scenarios. Actual existence provides sufficient material. Conjoined twins are "connected"; according the definitions and reasoning you've supplied, neither twin is a "human life" or has rights? But no. It is an admitted complication for "individual rights" that neither twin is individuated, but our resolution is not that either twin has the "right" to murder its twin (because the victimized twin somehow fails to meet our definition of entity (! ), or human being). Conjoined twins still have rights, because they are entities possessed of rights by their nature. In real life, a mother carries a child for some time before birth. It is a human child. The point at which that is true is not conception (where that "potential human child" is but a collection of cells, and fully the mother's to do with what she wishes), but it is true at some point thereafter. The proper way to reason about this has nothing to do with the umbilical cord, which is meaningless. Suppose a full "test tube" process, where there is no umbilical cord at all, no "connection." At conception, the potential child in the test tube would be a clump of cells, property, and wholly the mother's to dispose of. At some point thereafter, this would no longer be true. The cells in the test tube will have developed into a human being, and no longer be the mother's property (though the parental relationship is still special, and this special relationship persists for some time). At this point, the human child has rights and cannot be aborted. The difference is not according to placenta or umbilical cord or birth, but based on the nature of the entity itself. Surely, the rights aspect is a done deal? Nothing and no one has the right to interfere with the mother's rights of choice to end her pregnancy. But this needs to be separated from what also matters, to my mind, the morality of so-called "full term" abortion. Speaking solely on "right to life", Rand put it: "To equate the potential with an actual, is vicious, to advocate the sacrifice of the latter to the former, is unspeakable..." I agree fully. Does this mean that "the potential" is of zero value? A student engineer is a potential engineer, for instance, with the actuality in his future. I suggest, this is arguable, that there is a sliding time scale between potential and actual, in which a potential gradually gains in value, objectively, as the vital signs and "viablity" of the fetus increase. Late -term (or 'full-term') abortion for arbitrary, subjective-emotional reasons, would be irrational. A woman who casually has avoided making a decision (with all the highly-available previous interventions of her pregnancy, including the adoption option) up until the moment of birth, when a potential life was growing inside her, strikes me as hedonistic, irrational and immoral (and the surgical procedure is quite horrible to imagine). Her right to do so remains. "A piece of protoplasm has no rights—and no life in the human sense of the term. One may argue about the later stages of a pregnancy, but the essential issue concerns only the first three months. To equate a potential with an actual, is vicious; to advocate the sacrifice of the latter to the former, is unspeakable. . . . "
A piece of protoplasm has no rights -- and no life in the human sense of the term. But a "full-term fetus" has life in the human sense of the term. It has as much life as a baby, post delivery. It is no longer a mere "piece of protoplasm" or (as Rand elsewhere describes, speaking on this subject), "a few human cells," or an "embryo" -- but it is a baby, a human being. Not "potentially" so, but actually so. If equating a potential with an actual is vicious, treating an actual as some mere potential is more so, and with far less reason. Ah yes. I had forgotten the most telling part: "...the essential issue concerns only the first three months". Thanks, that bolsters my suggestion of growing "actuality". One may - indeed - "argue about the later stages", and one could extrapolate what Rand would have thought about that taken to the extreme - full-term abortion. Yes. I'd like to add that Rand held great contempt for the conservative view on abortion throughout her life. Less than two years before her death, she wrote an October 18, 1980 letter declining an invitation to speak to conservatives, because: "This year in particular, I would be ashamed to be connected with the so-called Conservatives in any way. Their anti-abortion stand is outrageous--and so is their mixture of politics with religion." (Letters of Ayn Rand, p. 666) Ronald Reagan was elected president in November of 1980. I think Rand sometimes spoke too loosely around the topic of abortion and conflated life with personhood. She was dealing with these "disgusting frauds" and was probably trying to establish herself as the pro-life advocate, in contrast to their hypocrisy. Unfortunately, she got a little caught up in her opponent's rhetoric. That is informative and well said, Mister Swig. I am not one of those who thinks Rand would "have ascribed rights to an unborn fetus". As I said "Her [the mother's]rights remain". However, individual rights aren't "a code of values to guide man's choices and actions". One has the right to do what one chooses with one's body. One may ingest into one's body (or extract) whatever one wants. But- to do so is not always rationally moral. What one can do isn't necessarily what one should do. My angle is only this. A pregnant woman who carries a fetus to full term, to then abort, is at very least, self-irresponsible, at worst evasive. This boils down to values and self-value: to know one is pregnant and to continue for trimesters in that knowledge, implies one rationally sees a valuable future in having a child (accepting un-sacrificially all the consequences on one's life) and anticipates great value in a new-born life and eventually, the grown adult. The woman is prepared to put other things on hold, planning long term. Before then she has plenty of time to weigh things and competing values up in her mind, before the "potential" gradually becomes an actuality. So why change her mind, literally, last minute? There may be rare, unforseen events or new information she comes by, but I'd think they'd have to be fundamental, such as receiving fresh medical info about the fetus or her body. Then full-term abortion would be a necessary emergency procedure. But for her to arbitrarily deny and overturn the (presumed) previously high value she entertained in giving birth to an infant, (which has now reached total life-viability), in favor of ending that life (because, e.g. : my new boyfriend says he doesn't want a kid around - and the many subjective justifications that we know people will make) - would be immoral on her part. In future, full-term abortion will be cynically seen as a get-out-of-jail card, or a last minute reprieve for the irrational. A woman's right to do so remains unquestioned. I think Rand sometimes spoke too loosely around the topic of abortion and conflated life with personhood. I agree that Rand may have spoken too loosely, at times, and especially when speaking extempore. I further agree with you that "life," as such, is not the salient issue. 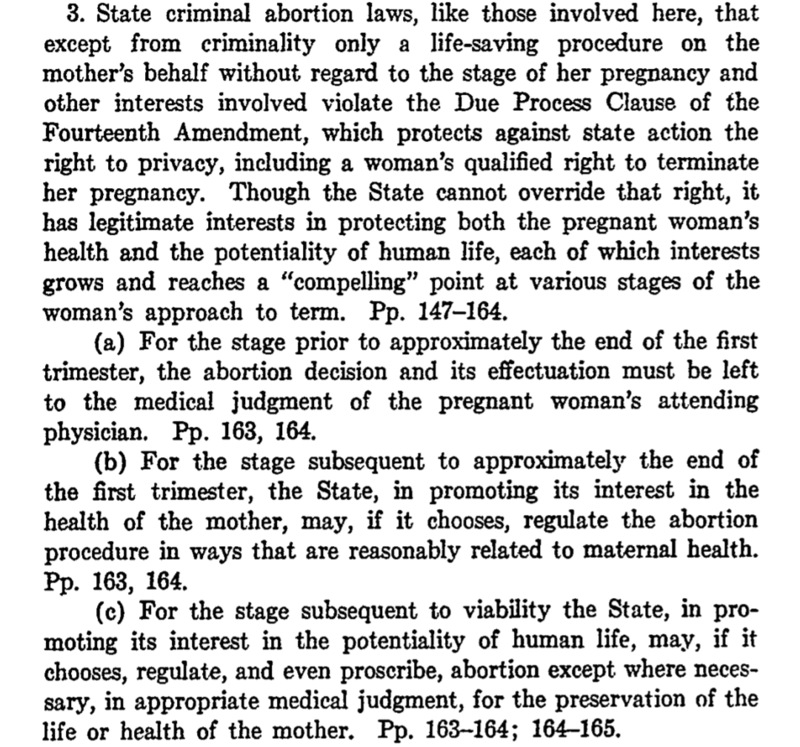 That said, I would argue that her meaning is fairly particular and clearly drawn when she said, as I'd quoted, "One may argue about the later stages of a pregnancy, but the essential issue concerns only the first three months." When she says that "one may argue about the later stages of a pregnancy," I take her as meaning that one may argue about the later stages of a pregnancy; when she says that "the essential issue concerns only the first three months," I take her as meaning that the essential issue concerns only the first three months. Given that, Rand and I are "essentially agreed" -- when we are discussing, as she termed it, a "piece of protoplasm," there is no question as to the right of abortion. This is enough to set Rand against many conservatives (whom Objectivists all-too-often seem to consider their ideological allies, and it ain't so), but I don't think it means that Rand would necessarily have embraced "full-term abortion," as some appear to contend, or that full-term abortion is consistent with her ideas more generally. After all, it would have been easy enough for her to say, "One may not even argue about the later stages of a pregnancy; the issue encompasses the entire duration until birth." It's rather amazing to me that there are people who appear to believe she said the former while somehow meaning the latter, its very opposite. So why change her mind, literally, last minute? There may be rare, unforseen events or new information she comes by, but I'd think they'd have to be fundamental, such as receiving fresh medical info about the fetus or her body. Then full-term abortion would be a necessary emergency procedure. But﻿ for ﻿her to arbitrarily deny and overturn the (presumed) previously high value she entertained in giving birth to an ﻿infant, (which has now reached total life-viability), in favor of ﻿ending that life (because, e.g. : my new boyfriend says he﻿ doesn't want a kid around - and the many subject﻿ive justifications that we know people will make) - would be immoral on her part. I could quibble with your characterization of her decision as "arbitrary," but it's not a big deal. I agree, in principle, that arbitrarily aborting any fetus, at any stage, would be terribly immoral. An abortion should be absolutely necessary, particularly in the third trimester, for the woman's physical or mental health. I understand that some women might not be psychologically fit to give birth and live with the consequences, even if the baby can be adopted. And this unfitness might manifest late in the pregnancy due to some unforeseen personal problem or family tragedy. ...but﻿ I don't think it means that Rand would necessarily have embraced "full-term abortion," as some appear to contend, or that full-term abortion is consistent with her ideas more generally. She also made her position absolutely clear in Of Living Death: "A child cannot acquire any rights until it is born." This is the article to which she referred people who wanted her view on abortion during a 1976 Q&A. After another look, I also noticed this paragraph, where she briefly addresses the idea of fetal rights: "In regard to the moral aspects of birth control, the primary right involved is not the 'right' of an unborn child, or of the family, or of society, or of God. The primary right is one which--in today's public clamor on the subject--few, if any, voices have had the courage to uphold: the right of man and woman to their own life and happiness--the right not to be regarded as the means to any end." She appears to be saying that even if the unborn child has a right, it is subordinate to the rights of the parents. 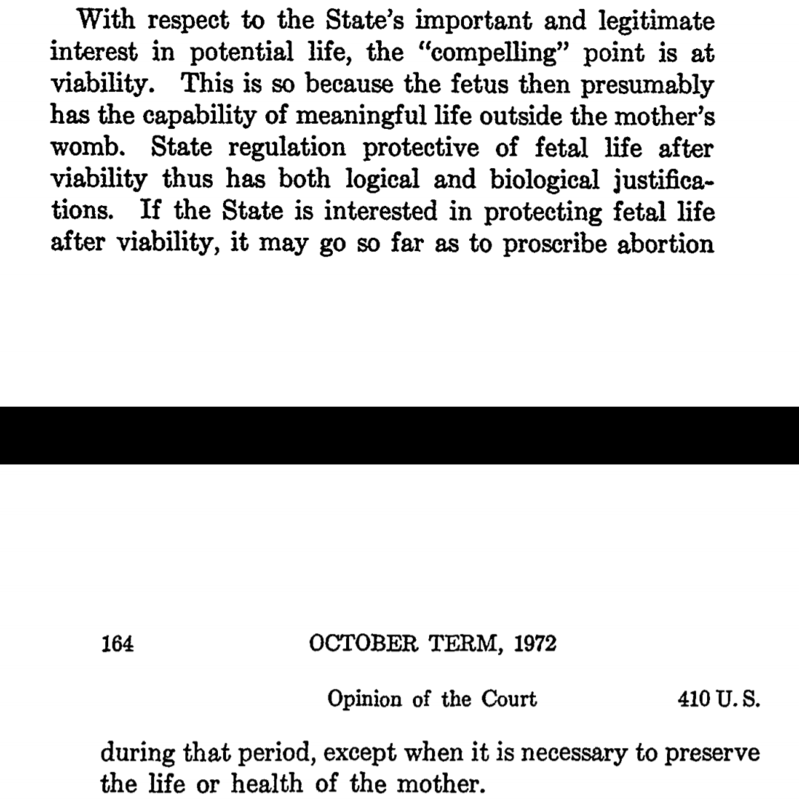 It's my understanding that Roe v. Wade (which I expect is the decision referenced, but correct me if I'm wrong) stops short of "full-term abortion," allowing legislation at or after the point of "viability." I could be wrong about that, but if so, then Rand's agreement with the Supreme Court does not distinguish between our arguments. It's not altogether clear to me that Rand was clear in her own mind on the particulars of the subject, but "birth control" is very far (and fundamentally) removed from "full-term abortion" (except in the minds of many conservatives, whom Rand may have been setting herself against, to the detriment of further nuance). Besides, we all agree about "the right of man and woman...not to be regarded as the means to any end." Yet parenthood itself carries certain obligations; and while I don't regard a mother as the means to the end of her child, should she neglect to feed her newborn or otherwise provide it care, and it dies, then she is liable for that. Saying that "she is not to be regarded as the means to any end" is not rhetorical magic; it doesn't change the facts on the ground, and that is that the mother of a newborn is responsible for that life. There ought to be and are means by which she can divest herself of that responsibility, legally and morally, but she must do so in a way that allows the newborn to live as well. If we're agreed on that, then the difference we're discussing is between one week (or day, or hour, or minute) before delivery and one after. The question seems to turn on the nature of the entity -- Rand discounts the "embryo" because it is merely some human cells, is "protoplasm," etc. But the full-term fetus is not merely a few human cells, it is not protoplasm, it is not an embryo, it is not the stuff of three months -- it is a human child. Justice requires that we treat things according to what they are. Rand's "essential" position on abortion is appropriate to the "embryo" to which she referred, to the "piece of protoplasm," to the initial three months she addressed herself to. The unborn child at three months is fundamentally different than nine months (but not much different than delivery plus a day). It is the difference in that entity which requires us to treat them differently. It's worth belaboring a point already made from this quote. AR: "You may argue that medically an embryo is alive at six to eight months. I don't know. No woman in her right mind would have an abortion that late. It's very dangerous for her. So nature is consistent with the interests of both". It's﻿ my﻿ understanding that Roe v. Wade (which I expect is the decision referenced, but correct me if I'm wrong) stops short of "full-term abortion," allowing legislation at or after the point of "viability." I could﻿ be wrong about that, but if so, then Rand's agreement with the Supreme Court does not distinguish between our arguments. Roe v. Wade happened four years prior to Rand's comment. Here is a copy of the Supreme Court decision. It actually allows states to regulate abortion for the mother's health starting in the second trimester. They can then regulate or proscribe for the potential life of the fetus starting at viability. Viability here means "capability of meaningful life outside the mother's womb." Here are relevant passages from the document. As far as the Court's opinion distinguishing between our arguments, there are two issues of fundamental concern: personhood and life. The Court decided that constitutionally an unborn fetus is not a person. They were clear that nowhere in the Constitution could the unborn be considered a person. Then there is the issue of when life begins, of which the Court took no absolute position, in the absence of a scientific consensus. There is a brief review of varying opinions throughout history. 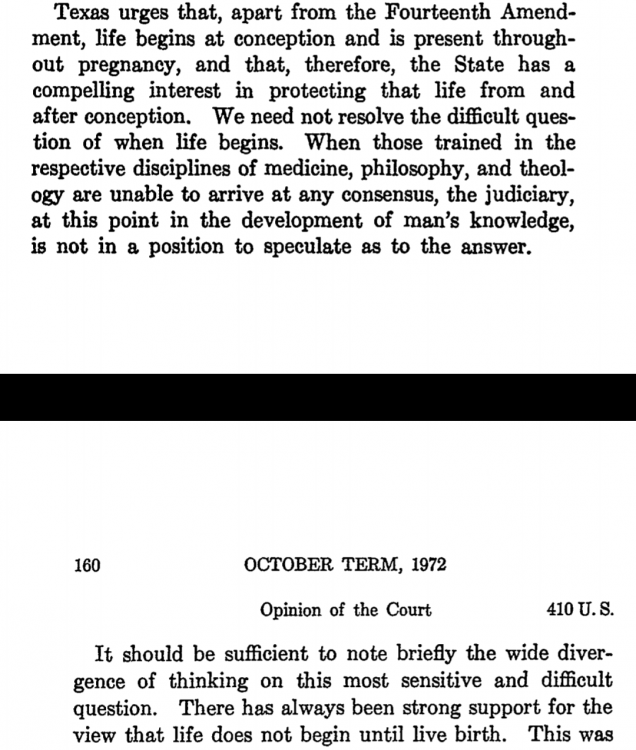 Given the final decision, I think the Court basically sided with the view that life begins at birth, but the lack of scientific consensus compelled them to give the states an interest in the later stages of pregnancy. Another clarification: Rand used the term "embryo" not only for the early-stage entity, but also for late-stage ones. A couple posts ago I quoted her using that word to describe a fetus up to eight months old, as well as "an unborn entity." Yes, she sometimes discounts the early-stage embryo as something like "a piece of tissue." But she also discounts the late-stage "embryo" as not having rights. Again, I accept that she expressed mixed messages on this point, particularly in her open Q&A sessions. However, I believe her prepared essay on the subject should take precedence. The﻿ unborn child at three months is fundamentally different than nine months (but not much different than ﻿delivery plus a day). It is the difference in that entity which requires us to treat them differently. And we do treat them differently. But you claim that an unborn child is a human being with a right to life, and I don't see evidence for that. I have delved into the fundamental philosophical and biological evidence, but you simply dismiss my arguments as rationalism. A human being is what it is: we don't define it in or out of being. The entity that is a human being one minute post-delivery is also a human﻿ being one minute beforehand; to say that it is not yet "a human life" because it fails to satisfy some ad hoc, contrived definition (in this case, because it is "connected") is a classic example of rationalism. I'm glad you agree that a human being is what it is. But until you provide your own definition, I think we're at a standstill. You could play the "one minute before" card all the way back to conception. It still wouldn't clarify your idea of what is a human being, nor a human being with a right to life. The "one minute before" argument sounds like true rationalism to me. Instead of building your concept from the ground up, you're maintaining it from the sky down. At which point in this path from birth to conception does the rights-bearing child become something essentially different? I'm with you on the last, I also don't believe Rand would "have embraced "full term abortion""(on rationally-moral grounds). I think it's useful to approach the 'Objectivist-conservative-ally' area since it arises in almost every topic, nowadays. On this one, clearly, Rand launched her moral attack against the conservatives who held much more sway at the time, in particular on abortion. "Pro-life"? Huh! A blatant self-contradiction, and anti-life (in a short summary of her). Those conservatives were and are mystic -intrinsicists, who on this subject held that life begins at conception, the embryo contains an immortal soul, and all that. From there, their notion of divine value they fight tooth and nail for. However, the philosophical and political landscape has shifted. As things have progressed in the last decades, there is another front that Objectivists need to be concerned about: the body of thought that's become much more prevalent and powerful - secularist (subjective) skepticism. They who visibly promote: "Whatever" ... anything goes - and, who knows? - and, it is good, if you feel it is - etc. (and mankind is composed only of meaty stuff, anyhow). I think, too, skepticism and the skeptical/subjective theory of 'value' is as lethal as the intrinsicist theory, and growing stronger. Also, that the pro-choicers have made somewhat of a mockery of the concept of "choice', being mostly deterministic. I notice that my stance here may appear "conservative", in that I espouse a general value in life which may mistakenly be taken to be intrinsicist. But then I can never view a full term infant as meaty stuff, with no objective value to anyone. And I can't speak for other O'ists who might ~seem~ to lean skeptical or intrinsicist. Because both are false theories, we know, and finding the route through to objective value isn't always easy.